Not to be confused with the Greek town called Nigrita and Philippine island of Negros. 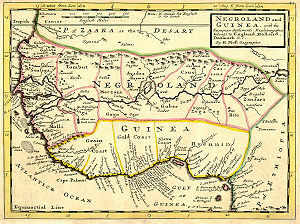 A 1729 map titled: "NEGROLAND and GUINEA. with the European settlements. Explaining what belongs to England, Holland, Denmark &c." By Herman Moll Geographer. ^ Lucas, Fielding. "A General Atlas Containing Distinct Maps Of all the Known Countries in the World, Constructed from the Latest Authority. Written and Engraved by Jos. Perkins, Philadelphia. Baltimore". Fielding Lucas, Jun. No. 138, Market Street. Baltimore. Entered ... by F. Lucas Jr. of the State of Maryland June 3, 1823. Retrieved 14 July 2013. This page was last edited on 16 December 2018, at 02:44 (UTC).